The industry gold standard for laser tattoo removal is a cosmetic medical device called the Medlite C6. 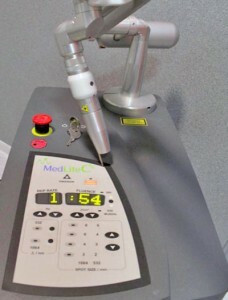 The Medlite C6 has been in production for several years and is a Q-Switched Nd:YAG laser. It was first produced by a company called Hoya ConBio. Hoya ConBio was acquired by Cynosure in 2011. Cynosure continues to produce the Medlite C6 because of its efficacy in laser tattoo removal as well as its ability to deliver other aesthetic solutions for patients. The Medlite C6 utilizes PhotoAcoustic technology which means the laser delivers strong levels off energy within short pulse durations. The beam of energy produced targets pigmented skin and collagen and destroys the pigmentation. Since the Medlite C6 only targets pigmented skin / tattoo ink, the rest of the surrounding skin is unharmed. The Medlite C6 utilizes an electro-optic (EO) Q-Switch platform. The Q-Switch acts as a high-speed shutter, holding energy until enough has been stored until peak power has been reached. When energy levels are at the desired level, the laser will produce its peak power output of 200 megawatts. The shutter capability allows the laser to deliver this energy in 5-20 nanosecond pulse widths. The targeted chromophores in the pigmented literally vibrate and shatter when hit by this flattop beam of energy. Multiple Wavelengths: By adding on additional handpieces, the Medilite C6 laser easily delivers multiple wavelengths of energy: 532nm, 585 nm, 650nm and 1064 nm. With these Multilite Dye handpieces you have the ability to treat multi-color tattoos including the following ink colors: black, dark blue, red, sky blue and green. In addition to laser tattoo removal, the Medlite C6 has further applications such as the treatment of pigmented lesions (age spots, sun damage, Nevus of Ota), wrinkle reduction, skin resurfacing and acne scar reduction. This one unit has become a serious workhorse for many cosmetic and aesthetic practices worldwide. The effectiveness of this laser combined with its low maintenance costs and high utilization means that it provides any practice an excellent return on investment. Adding one of this units to your practice makes economic sense. Purchasing a used Medlite C6 will allow you to save significant on invested capital while allowing you to take advantage anticipated future revenue opportunities. It is expected that the demand for laser tattoo removal services will reach upwards of 7 million by 2017. The associated revenue for practitioners is estimated at $1.3 billion.